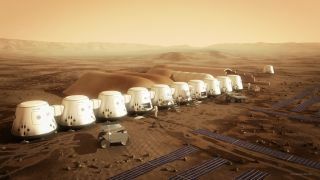 Artist's impression of Mars One's planned colony on the Red Planet, which would begin with the touchdown of four people in 2025 and continuing growing thereafter. One hundred people are still in the running to become humanity's first Mars explorers. The Netherlands-based nonprofit Mars One, which aims to land four pioneers on the Red Planet in 2025 as the vanguard of a permanent colony, has whittled its pool of astronaut candidates down to 100, organization representatives announced Monday (Feb. 16). "The large cut in candidates is an important step towards finding out who has the right stuff to go to Mars," Mars One co-founder and CEO Bas Lansdorp said in a statement. "These aspiring Martians provide the world with a glimpse into who the modern day explorers will be." The remaining pool consists of 50 men and 50 women who range in age from 19 to 60, Mars One representatives said. Thirty-nine come from the Americas (including 33 from the United States), 31 from Europe, 16 from Asia, seven from Africa and seven from Australia. The remaining candidates will next participate in group challenges, to demonstrate their ability and willingness to deal with the rigors of Mars life. After another round of cuts, the finalists will be divided into four-person teams, which will train in a simulated Red Planet outpost. Eventually, Mars One intends to select 24 astronauts (six four-person teams), who will become full-time employees of the organization and prepare for the Mars colonization mission. "Being one of the best individual candidates does not automatically make you the greatest team player, so I look forward to seeing how the candidates progress and work together in the upcoming challenges," Kraft said. Mars One wants to send new four-person crews to the Red Planet every two years or so after the first touchdown, which would take place in 2025. At the moment, there are no plans to bring any of these Mars colonists home to Earth. The organization plans to pay for its ambitious activities primarily by staging a global media event around the colonization process, from astronaut selection and training to the pioneers' time on Mars.